Participated in kickabout and walked out with the players ahead of Championship clash. 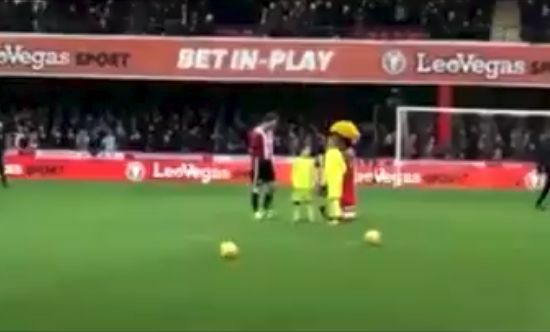 As part of his stag do, it was arranged for the groom to be one of Championship side Brentford’s mascots for their 2-0 win over Bolton at Griffin Park on Saturday. My son (aged 8) thought you did very well in the little training drills you did but was very clear about how unfair it was letting an “old man play with the kids”. Well done for taking it like a stag should. Kept us Bees fans amused. thanks! Tried to take it with good grace and not get in the way of the "proper" mascots having their big day.